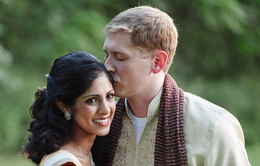 Neha and Michael - Sonal J. Shah Event Consultants, LLC. they all raved about how smoothly the weekend went and several commented that they now understand why a wedding planner is so essential. Thank you for introducing us to some remarkable vendors that we otherwise would never have been able to find. And thank you for running interference with all the vendors on the day of the wedding so that my mother and I could enjoy ourselves. It was truly the best day of my life and the most fun I’ve ever had. I couldn’t have asked for better.